A few months back I started assiting the fine developers over at SpinTriplet in doing bug and beta testing of their revamped and sorely needed Air Traffic Control dashboard widget for Mac OS X 10.4. I donated to the cause (the widget is donationware), and poked and prodded them to continue development despite facing a major setback: Apple had released their Extreme ‘N’ Enabler, and blown a hole through the development of a widget that was initially just trying to grapple with the new Intel Macs, let alone a new unratified wireless protocol. As it turned out, I was of considerable help, having an Intel Core Duo iMac, a Core Duo MacBook, and a Core2Duo MacBook, coupled with both a b/g Airport Extreme and a new Airport Extreme N wireless router. Installing the then newborn beta widget on all three computers, I set to testing and reporting console logs and screenshots for the developers. Of course, I had a vested interest in all of this: There was no other widget nor application that could accurately display the Core2Duo’s wireless signal strength and scan for networks at the same time. There are several applications which have since been updated to better work with the new Core2Duo Macs, but I wasn’t interested in an application- I wanted a widget that I could pop open when I’m roaming and traveling to scan for open networks and find the strongest connection areas. Air Traffic Control has been around for awhile, sporting a few different looks, but its latest incarnation is extremely slick, and still functions as well as it looks even for a beta. 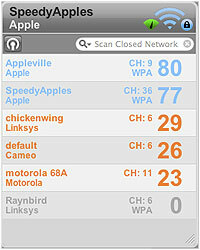 Currently at 2.0.1 beta400, Air Traffic Control runs flawlessly on the three Macs I have here at home. There simply isn’t a better Airport widget available which includes both the functionality and the style of Air Traffic Control. It’s one of the handful of widgets that I consider essential for a mobile Mac user, and one in which I had no issue paying for. Now you can “knock out the fat” and pump out some killer tracks at the same time. 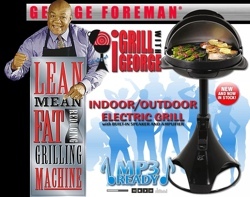 In the “now I HAVE seen it all” category we have the George Foreman iGrill. For USD$149.00 you get an indoor/outdoor electric grill with a built-in 10 watt amplifier and speakers. The site doesn’t provide many details, but it looks like it will support any MP3 player, so I assume it is using the 1/8″ mini jack to connect to the grill, and not the iPod’s 30-pin dock connector. From the images it looks like there is a holder near the base of the grill where you would set your iPod. I am guessing the speakers are also mounted near the base of the grill. Now, in checking Apple’s iPod tech specs the rated operating temperature is 32° to 95° F (0° to 35° C), so it’s a good thing the iPod is kept far away from the grill, but I imagine that doesn’t make for convenient operation. I would also worry about hot grease splattering and raining down on my precious Pod. Definitely not for most, but if you would like to hickory smoke some ribs and listen to the Maccast I’m not going to stop you. Finally, some good news to counter the unfortunate news on the Leopard-front, albeit on the 10.5 Server side of things. I guess beggars can’t be choosers, right? If you’ve been keeping up with all the new (non-surprise) features of Leopard, you probably have heard about the new iCal Server. It’s an open-source, open-standards server that promises to help users publish, schedule, share, collaborate on events, instead of simply posting and subscribing to events through the iCal client today. 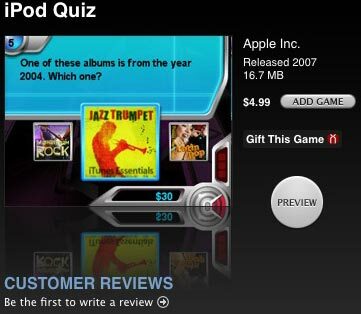 Earlier this week there were reports of a new iPod game, “iQuiz” surfacing on the French iTunes store and then quickly disappearing. Well I was just on the iTunes US store (12:51 AM PDT 4/24/07) and saw the game featured on the main page and for ONLY $0.99? I of course clicked through immediately and the resulting page showed the standard price of $4.99. Unfortunately when I tried to buy a copy it reported that the item was no longer available. Bummer. Not sure if this means they are launching it today and just getting it set up or if it is another fluke. Just in case I grabbed a screen shot (below) and a screen capture of the preview video. Basically this looks like an updated version of the iPods previously built-in “name that tune” style game with a much improved interface and graphics. It also claims to have the ability to create and share your own quizzes, so that should prove fun. Update: Well… Looks like it is official and it’s only $0.99! Great price, but no scoop here. Darn. Looks like I just caught them setting things up in the wee hours of the morning. A podcast about all things Macintosh. For Mac geeks, by Mac geeks. Show 184. Security Update 2007-004. iTunes contact negotiations will get pushy. Apple TV expanding “big box” presence. MacBook Pro successfully hacked in security contest. Please sign the Save Net Radio.org petition. BBC iPlayer will be coming to the Mac. Clearing up the 720×304 video on iPod confusion. Feedback on OS X Active Directory support. Buy your software, please.. Review of El Gato eyeTV Hybrid. Combo Updater can offer a magic fix. Tip for creating quick playlists from a selection in iTunes. Thoughts on Apple allowing re-downloading of purchased content from iTunes. Concerns over bulging MacBook Pro batteries. Apple sees significant market growth in a year. A podcast about all things Macintosh. For Mac geeks, by Mac geeks. Show 183. Apple delays Leopard. iPhone on schedule. The Octo Mac has arrived, performance results. The 100 Million iPod March… ok April. MGM flicks roar onto iTunes… more like meow. New Apple TV and Get a Mac ads. Airport Extreme Basestation update. More Apple TV hacks. Apple may have bigger “media center” plans. Rumors of 6G iPods before 2008. NAB: Final Cut Studio 2. Let Them Hear You promo. Corrections and follow-up, how to type ellipsis, EMI DRM Free album pricing, Screen Recycler, locking down wi-fi to one access point, photo syncing with Apple TV. Review SRS iWow Plug-in. 720 x 304 resolution video on an iPod. Active Directory support in OS X. Review: Koloroo iPod “Widgets”. Listener recommended quick tips. Using the AirDisk on new Airport Extreme. Don’t foregt to write your Teach Mac modules for double rewards. The new Maccast.com web site. Promo for the Let’s Get Down to Earth… Science Podcast. Free 14-day trial of AudibleListener Gold Monthly with free download. Ok Apple did it too, so I don’t feel as bad. For once, the rumor mill was right: Apple will be delaying Leopard, the next release of Mac OS X, until October. The company said in a statement Thursday that because of the push to get the iPhone out by June, it had to pull engineers from the Leopard development effort and reassign them to the iPhone. As a result, Leopard won’t be finalized until later this year, and only a preview version will be available at Apple’s Worldwide Developers Conference in June. Looks like maybe Apple should have named it after a slower cat. iPhone has already passed several of its required certification tests and is on schedule to ship in late June as planned. We canâ€™t wait until customers get their hands (and fingers) on it and experience what a revolutionary and magical product it is. However, iPhone contains the most sophisticated software ever shipped on a mobile device, and finishing it on time has not come without a price â€” we had to borrow some key software engineering and QA resources from our Mac OS X team, and as a result we will not be able to release Leopard at our Worldwide Developers Conference in early June as planned. While Leopard’s features will be complete by then, we cannot deliver the quality release that we and our customers expect from us. We now plan to show our developers a near final version of Leopard at the conference, give them a beta copy to take home so they can do their final testing, and ship Leopard in October. We think it will be well worth the wait. Life often presents tradeoffs, and in this case we’re sure we’ve made the right ones. Editor’s comment: Has Apple been having their water imported from Redmond? Seriously, they couldn’t just use some of their vast cash reserves to hire some additional developers? I guess Steve was really serious about the dropping of the whole computer from the Apple name. I love iPods, the Apple TV, and the iPhone as much as the next Apple fan, but come on. Apple’s roots and the heart of company are in the OS and in the glorious systems we get stuff done on each and everyday. Has Apple lost sight of that in lieu of the consumer success of the iPod? Leopard has already had the longest development time of any OS X update to date. I don’t think Apple is giving us the whole story here. Let’s just hope they don’t pull another play from Microsoft’s rulebook and start ripping announced features out of 10.5 just to try and make their new ship date. New Maccast on the way, stop worrying. Just wanted to write a quick note to address a few concerned emails I have received recently. I realize I am a couple days late in getting out the next show, but rest assured I am currently hard at work on the next cast. I will fill you in later, but in essence with the Easter holiday and some other personal things I have fallen a bit behind. I actually paused briefly from my show prep just to make this post. As you can see, I also recently re-launched Maccast.com with a brand new design so that distracted me a bit too (what do you think?). I think it was worth it. Please don’t read anything into this delay beyond the fact that I have a busy schedule. The Maccast Loop was also skipped last week due to Victor (Typical Mac User) being off on a well deserved vacation. Expect the Loop to be back this Sunday as scheduled. Thanks for understanding and I will talk with you soon.